Bring your pain to us. "Where pain is treated with personal care"
Why put up with your pain? Frankfort is ideally located in the heart of central Kentucky, and within driving distance of Lexington, Shelbyville, Lawrenceburg, and Georgetown. Frankfort Chiropractic Center is Frankfort's best known Chiropractic office. Simply put, our patients come first. We listen to you and will support you through all phases of your care. Our Chiropractic office includes two locations in Frankfort. We have multiple chiropractors and massage therapist with different styles available. In addition we are part of a larger group of chiropractic providers with offices in: Georgetown, Falmouth, Cynthiana and Williamstown. Our office was built with you and you in mind. Come visit to see what we are all about. Our practice treats a variety of conditions from chronic low back pain and neck pain to rehabilitation following an accident or work injury. Our mission at Frankfort Chiropractic Center is to provide affordable, high-quality care to people of all ages. We strive to not only correct a person's health problems, but to educate and enlighten people so that they do not encounter similar problems in the future. Our office offers adjunct therapy, which in conjunction with regular chiropractic care, can greatly reduce recovery time and improve performance. We commonly use TENS units, therapeutic ultrasound, electric muscle stimulation, traction/decompression and stretching and exercises. Although manual hands on adjustments are our offices primary type of treatment we also include active and passive modalities when needed. EMG/NCV testing is performed in our office by Dr. Luking currently using a Cadwell Sierra Wave machine. Since 2004 Dr. Luking has performed test for patients in our office and referrals from other chiropractors and physicians. If you are a treating provider and have questions about possible testing please call the twin oaks location and speak with Dr. Luking. Inquires into these services including rates and completion time can be directed to Dr. Luking. Currently our group has five chiropractors registered to perform peer review. 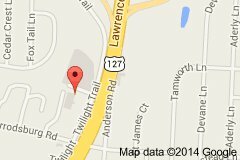 We offer 2 locations to serve you better! Our first location is at the corner of US 127 and Twilight Trail, on the west side of Frankfort convenient to both Franklin and Anderson County residents. We have been serving Frankfort since 1988. Dr. Jason W. Luking continues to see patients at the Twin Oaks location. Dr. Jason Luking is married to Dr. Rebecca Luking, a family physician practicing in Frankfort. They both attended Georgetown College. Dr. Luking graduated from Palmer College of Chiropractic in 2000. He treated patients in Virginia and Ohio while his wife attended medical school and completed residency. Dr. Luking and his wife consult daily on difficult cases and treat together many patients with musculoskeletal problems. He currently holds licenses in Kentucky, Ohio and Virginia. Dr Jason W. Luking, D.C. has owned Frankfort Chiropractic Center since early 2005. He has been trained to perform needle EMG and NCV examinations since 2004 and Peer review since 2008. Dr. Nathan Ritchie is available at the Twin Oaks location. Dr. Nathan Ritchie joined Frankfort Chiropractic Center in December of 2012. Dr. Ritchie attended Georgetown College for his undergraduate studies where he received a Bachelor’s Degree in Exercise Science and also met his wife, Lindsay. He then went on to complete his Chiropractic Education at Logan College of Chiropractic in St. Louis, MO. He has a special interest in working with athletic injuries and those interested in rehabilitation. Dr. Ritchie is a Native of Kentucky, growing up in Harrison County. He and his wife now reside in Lexington with their son. Dr. Brian Hendrix practices at the Brighton Park location. Dr. Brian Hendrix graduated from Fleming County High School here in KY, he holds a Bachelor’s of Business Administration degree from Morehead State University, and a Doctor of Chiropractic degree from Logan College of Chiropractic in St. Louis, MO. He has been practicing chiropractic in Frankfort, KY for the past 4 years and during that time have grown to love the town and people of Frankfort. Dr. Hendrix and his wife Amanda are parents to two wonderful little girls, Addison and Avery. Dr. Mark Spencer practices at the Brighton Park location. Dr. Mark Spencer graduated from Powell County High School here in KY and served four years in the Marine Corps before earning a Bachelor’s degree in Chemistry from Eastern Kentucky University. He received his Doctor of Chiropractic degree from Sherman College of Chiropractic in Spartanburg, SC in 1998. Dr. Spencer also served twenty years in the Army Reserves and Army National Guard as a commissioned officer and retired January 1, 2011. He has been practicing chiropractic in the central KY, northeastern OH and Tampa Bay, FL area for the past 10 years and has been living in Georgetown for over four years. Frankfort Chiropractic Center has five different massage therapists available to treat patients. Massage is one of the older, simplest forms of therapy and is a system of stroking, pressing and kneading different areas of the body to relieve pain, relax, stimulate, and to tone the body. Massage does much more than create a pleasant sensation on the skin, it also works on the soft tissue (the muscles, tendons, and ligaments) to improve muscle tone. Problems in the musculo-skeletal system can impede the natural healing process, and often cause dysfunction and pain. Most chiropractic doctors would agree that it is important to treat soft tissues such as muscles and tendons to help prevent and correct subluxations, and lessen the accompanying pain. Together, chiropractic and massage provide you with a more complete and effective system of health care. Local massage is often used in preparation for an adjustment. Massage relieves muscle tension and warms up the soft tissues in the area, making joints more pliable and more easily adjusted. Many chiropractors themselves (or an assistant) prepare an area with local massage. A general massage (1/2 to 1 hour long) can also be good preparation for an adjustment. In addition to preparing the immediate area of concern, it helps you relax overall and become more receptive to other hands-on treatment. Some find massage after an adjustment beneficial for further relaxation. With regular therapeutic massage, chiropractic adjustments may last longer. Relaxation massage therapy is also available at our office independent of chiropractic care. Visa/Mastercard. Cash plans are available with payment plans if needed. In case of an emergency, we can be reached at 502-875-3200. This will be forwarded to a mobile phone. If there is no answer, you may leave a message and your call will be returned promptly. ChiroWeb.com - the most widely read chiropractic publication on the web. ChiroFind.com - a chiropractic website specifically designed for patients and consumers. American Chiropractic Association - the official website of the American Chiropractic Association. World Federation of Chiropractic - the official website of the World Federation of Chiropractic. Chiropractic in the United States - Training, Practice & Research - a report by the U.S. government on chiropractic. Kentucky Board of Chiropractic Examiners - state agency responsible for protecting the public by licensing and regulating chiropractors. Do you have comments or questions? Use the form below to contact the Frankfort Chiropractic Center. Are you human? Spam block test.